Hands on LG V30 review: the most desirable LG phone ever? The LG V30 is an interesting phone, especially for us in the UK. You see, LG's previous V series phones, the V10 and V20, were considered to be better than the Korean's flagship G range, but, despite that, were never sold in the UK. 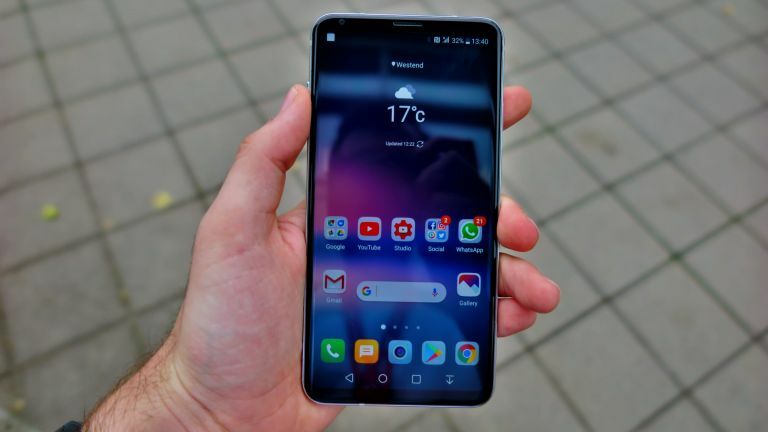 Now there's good news and even better news; the LG V30 looks like it could be LG's most desirable phone ever made, and, you'll be able to buy it in the UK from Carphone Warehouse. We've had a very brief play with it at IFA, these are our initial impressions. The first thing you'll notice when you pick up the V30 isn't the large 6-inch OLED display or upgraded specs, it's how light it feels. The LG V30 weights in at 158g, while, for comparison, the Samsung Note 8 weights 195g. Okay, the next thing you'll notice is that brilliant 6-inch screen. LG has switched to using OLED panels, and the result is fantastic. Resolution is 2880 x 1440, and the FullVision design has reduced the bezels around the edge even more than the G6, now achieving an 81-percent screen-to-body ratio (approx.). The sides of the display are curved slightly, but not to the extent of the S8/Note 8's Infinity Edge display, which some people dislike. It's a happy medium between the G6 and S8, we like it a lot. Underneath the screen you'll get Qualcomm's Snapdragon 835 chipset, 4GB RAM, 64GB expandable storage. From our initial play with the Lg V30, it felt very quick, which is what you'd expect as it's essentially the same set up inside most other flagship phones. The design is also particularly good, it's easily the sleekest and most desirable phone LG has ever made. At 7.4mm thick it's also thinner than the Note 8, which measures a portly 8.6mm. LG has released the V30 in four colours, black, blue, white and lilic, but it looks like we'll only be betting the blue or black in the UK. LG has carried over the similar camera setup from the G6, with a 16MP and 13MP dual camera system, one wide-angle, the other is super wide angle. It's very different to the other dual camera systems out there, and can be fun to use. Upgrades over the G6 include wider aperture to let more light in (now f/1.6 and f/1.9 respectively), as well as a clearer glass lens covering. LG has also focused on video recording, really focusing on the 'creative' user. The V30 features Cine Video mode, which records Cine Log video files which preserve a wide dynamic range and colour gamut, allowing greater control over editing the 'look' of the final video. These files can be edited on the phone, or a professional editing suite, like Adobe Premiere, for example. The Cine Video mode also features Point Zoom, which smoothly zooms in on a specific area, and should look much more cinematic and professional. These are neat little touches, and could be a killer feature for indie film makers or creative types. It's also great for people who really love music. In South Korea, the LG G6 featured a quad DAC which made music sound amazing, it's a killer feature which made that specific model stand out. Unfortuntely, LG never brought it to the UK. The V30 features the quad DAC which is tuning by sound engineers from B&O Play. It also comes with a set of Beoplay earphones. Not only that, the V30 is the first smartphone to support MQA (Master Quality Authenticated). This allows for the streaming of high-resolution audio, capturing the original sound of the studio master and folding it into a small, easy-to-stream file. Finally, whereas Samsung has developed the virtual assistant Bixby, LG is fully on board with Google Assistant (our current favourite AI). In fact, the LG V30 will have some unique capabilities, such as the ability to launch the camera in a specific mode using just your voice, as well as talking to other LG appliances, such as washing machines. We liked the LG V30, a lot, it's a desirable and innovative flagship with a number of very interesting and very useful features. All that remains to be seen is how competitively the V30 will be priced compared to the Samsung Note 8, and whether the camera, video, and battery will live up to expectations. Stay tuned to T3.com for more updates! Has Apple got what it takes?